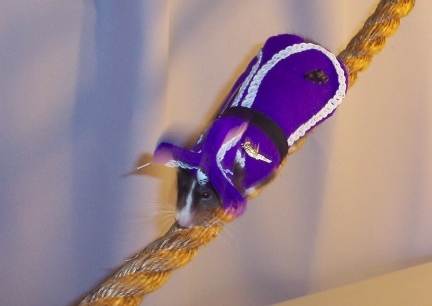 Rat Agility and Rat Trick Candidate, this page will be about our rattie Little Mac. It will be more of a training blog with photos. 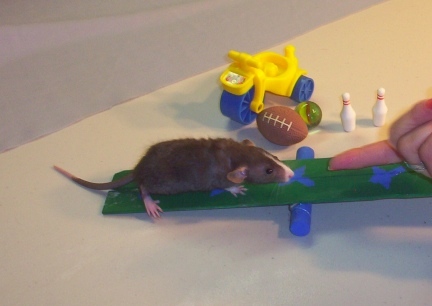 It was time to start training a new little rattie for tricks and agility. I started looking for a cute, photogenic little doe. I like the lighter colors, cream colored or tan, that is my favorite. It is not however what I ended up with. (How often does that happen? someone goes out with an animal in mind and is smitten by something that person thought they would not bring home??) 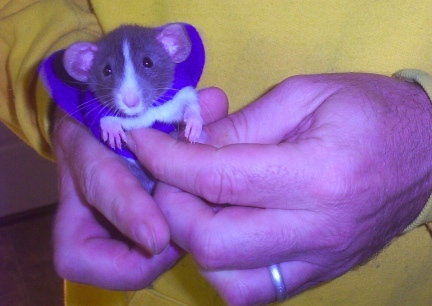 Well, Little Mac, named for computers, made famous by the opposite in hambergers, is a little bitty buck with big dumbo ears, dark colored with a blaze. Just what I would have told you, before my, "hunt for a new baby", that I would not get. 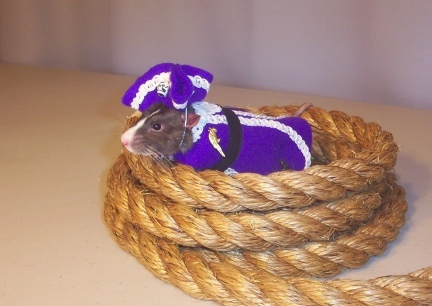 After all, he looks so much like my rattie Dutch. In fact, he is a 1/2 brother to Dutch. Dutch is such a good boy and he has such a wonderful personality and..... and so, we now have Little Mac. 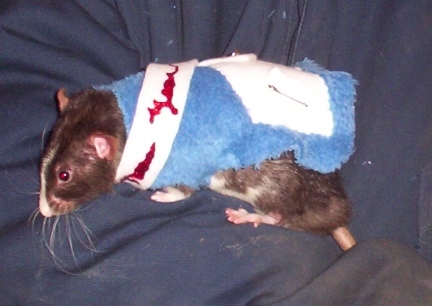 I would like to train this rattie to do a few tricks, and to run an agility course, or courses that I set up for him. So, training begins right away, or call it bonding. Little Mac spends much of his day on our shoulders while we work. Deron and I work at home and spend a lot of time on computers. We are working on teaching Little Mac his name, by using it often as we pick him up, talk to him and feed him. 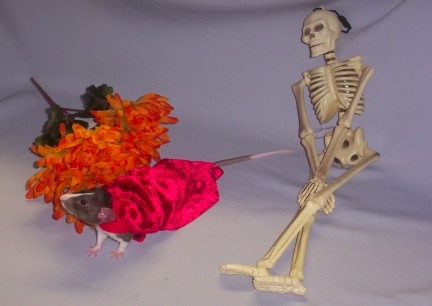 This is how we have in the past taught ratties to come when their name is called. So, we set it all up again. 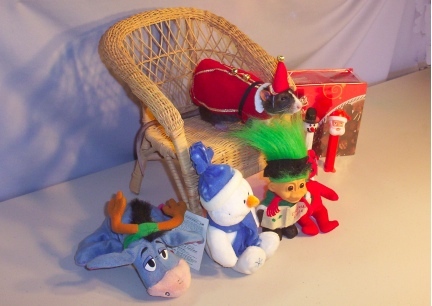 Toys in the background so he gets used to them as he will be working with them later <grin>. We did get a couple of videos (still coming) and I am just tickled pink with this little bitty boy. 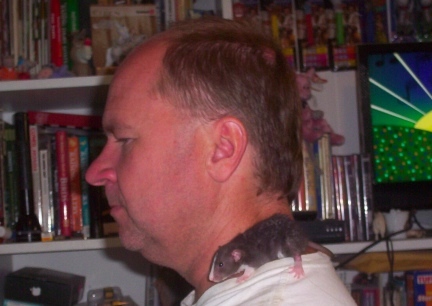 He is also learning "shoulder", my command word for the rattie to run up my arm to sit on my shoulder. I believe that Little Mac now knows his name and is quickly learning "shoulder" as the command to climb up our arms to our shoulders. So today Deron and I started putting our arms together, while Little Mac was on one of our shoulders and the other calling him by name and saying "Little Mac Switch Shoulders". We gave him a scoop push...gently pushing his rear toward the other arm. He did well. He is going to understand this pretty quick. Getting a photo of this, not too easy. 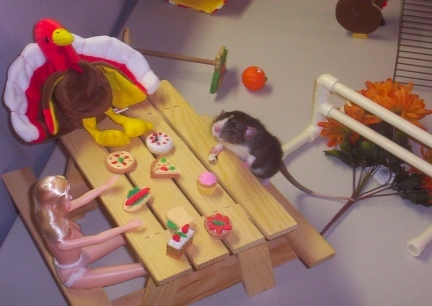 So I hope you enjoy the stuffed rat and Little Mac photo here. BY GOLLY! HE'S GOT IT! Little Mac now will do the "Shoulder Switch" with very little help from us. He still comes to me easier then goes to Deron (again I say, well, I am smiling). He is still not coming to his name from his cage, but he does look our way and wait for us to pick him up, with out walking away. Maybe he knows his name and is a bit, well, spoiled. Or thinks he is just suppose to wait for us to get him. Most of the time, you just do not know what goes on in those little heads...one thing is for sure, ratties are not stupid or untrainable. 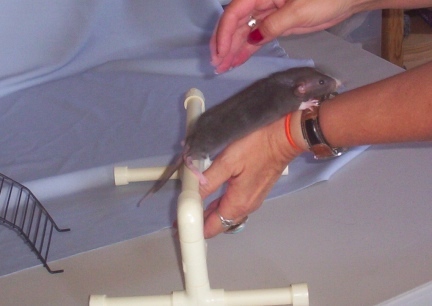 Little Mac has graduated to the Rat Agility Equipment now that he has grown a bit. He is doing very well with the Bird Arch A-Frame. The Tire Jump he wants to check out while in it...must be a boy thing. The PVC Bar Jump is a bit big for him still but he does pretty well with it....albeit he would like to come to me between the two bars rather then over the entire jump. If you know me, you knew it was coming. 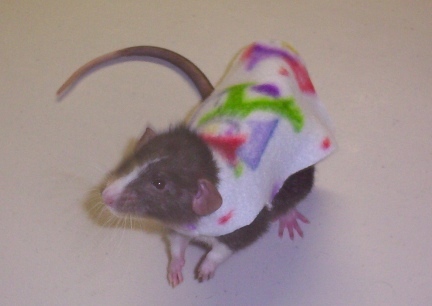 I made Little Mac a little outfit and today he has begun to wear clothes. Someone asked if that was a Rat Poisen mark on the back? NO! He is a PiRATe. 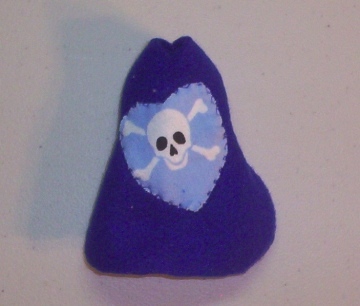 A PiRATe, I tell you. 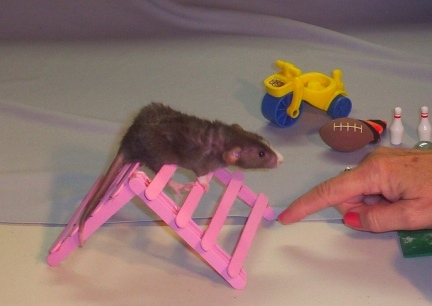 Little Mac has learned a few pieces of the Agility Equipment and is doing well. He now knows the Bird Arch/A Frame, Tire Jump, PVC Bar Jump, Teeter Totter, and finishes with "shoulder". 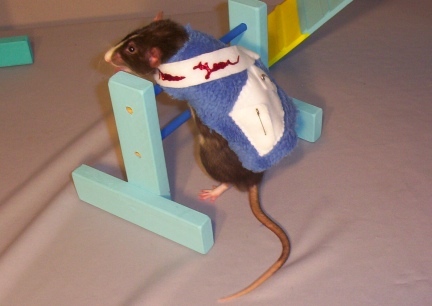 I try, try that is, to work with him each day with two three pieces of Rat Agility Equipment. I was setting them up in the same order, but now I change them around a bit. I am pleased with what he is learning. Today I painted a new jump for Little Mac. I set him up, so that he would be coming out of a basket, then do the new jump, then come up my arm. I am so tickled. Here he came out of the basket, WHEN CALLED, when he gets to the jump I said "over" and right over he went. Tomorrow, I think I will set him up larger course (he has done four pieces in a row now) and see how it goes. He is also doing the shoulder "switch" on command. I am so pleased with how his training is going. 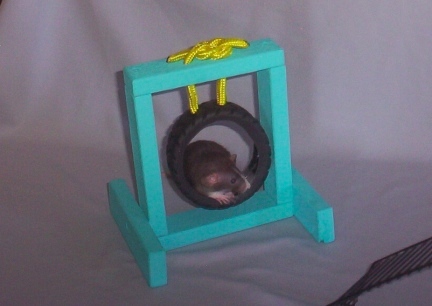 Little Mac now does five pieces of Rat Agility Equipment in a row. 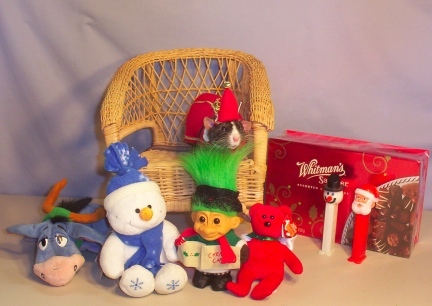 He comes out of the basket that has a lid, when called, then The Bird Arch/A-Frame, the PVC Bar Jump (which is large for him) an Open Tunnel, and then a small wooden Bar Jump. He does pretty well at five. 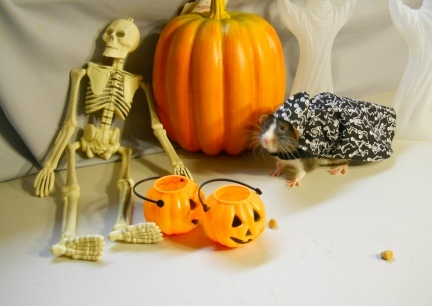 The Open Tunnel is brand new and, of course, like all ratties, he would like to stay in it. But he is doing it all pretty quickly. 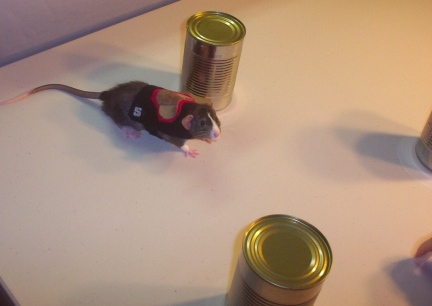 Deron put this video together of Little Mac's second and third time ever running the Rat Agility Equipment, well? hamster agility equipment that is. Little Mac is twice this size now and doing five pieces of agility equipment in a row, some things/videos just take time. 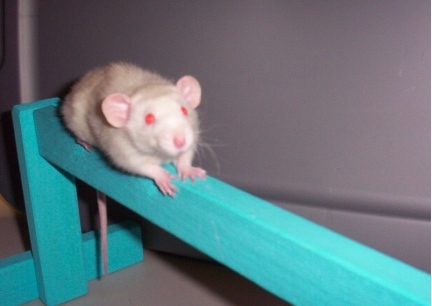 We have other training videos of a couple of our other (past) ratties on the Links and Videos page. Little Mac starts running "barrels" in the same clover leaf pattern as horses do in competition. His "barrels" are vegetable cans. You can see in the one photo that my left hand should not have been on the table. He should have been watching and coming to my right hand. My left hand distracted him. 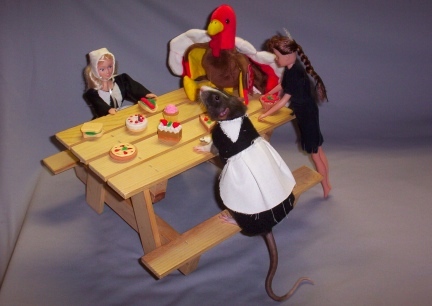 Now I know, live and learn, one hand on the table or at least keep both hands where the rattie should be coming. Today Little Mac took his first trip out. We went over to some friends on their piece of property, not too far from here. 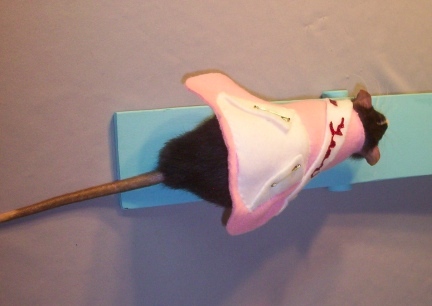 They were in their Renaissance Garb so Little Mac wore his Red Velvet Cloak. Dang it! We did not take the camera! Little Mac being a model. He is really good about being dressed up. And so cute in the outfits, well? at least I think so! LIGHTS, CAMERA, OH COME ON! DANG IT!! Little Mac is running the barrels pretty well now. At this point still following my finger, but doing well, he knows the pattern and will even outrun my finger. It is so cute seeing him run the same pattern as horses do in Barrel Racing Competitions! BUT WHY IS IT! WHY???? WHEN YOU GET THE CAMERA OUT....Well, you know what happens. He hesitates, no no lights on the camera, he stops... Deron has even been standing out of Little Mac's view thinking that might be it. We will keep trying. Also, Little Mac is now the "Shoulder" and "Switch" to vocal cues very well! He comes to his name almost always, and is learning to run up our arm when called from his cage. 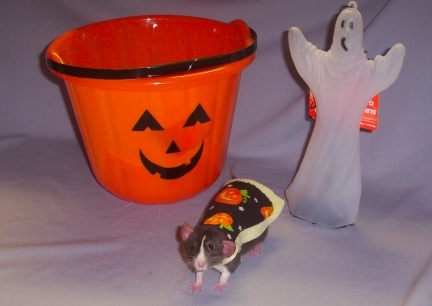 I had set up a Halloween Agility Course for Little Mac. All was going well, well, kind of. 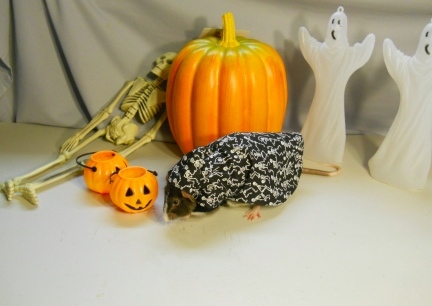 He hesitated on the Plastic Pumpkin Tunnel, many times turning to go back out the in....so, I put him in the end to start....voila! Worked like a charm. Off he went, from end to beginning or now, the new, Beginning to End without hesitation. No, that is not "back chaining". Back chaining is teaching one item, then when the animal is doing that item well, putting another item in front of the one done well, so that the animal now does the new item then the one they know. 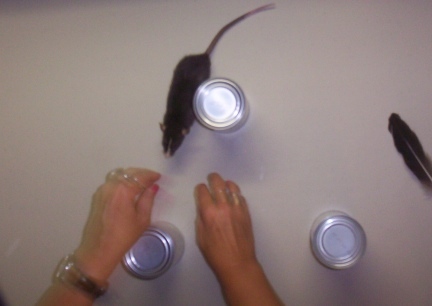 Many people teach agility like this to animals. Adding an entire course by "back chaining". Thanks to Deron for all the work he put into this Little Mac Halloween Video. He built the back drop and helped and tweaked the agility equipment. He also was the Camera Man, the Producer and Editor! 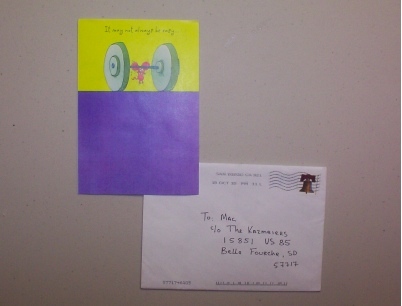 To our surprise Little Mac got a card in the mail. 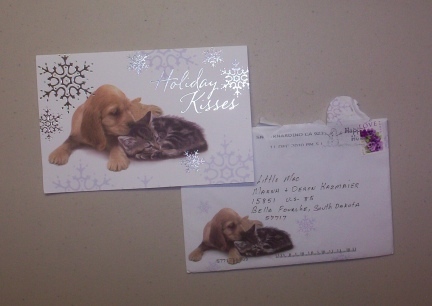 An efriend, Holly, sent him an encouraging note to hang in there and keep doing his agility courses. How fun is that?! HIS NEW LEATHER ENGLISH RACE HORSE SADDLE! Yes, yes! I know. 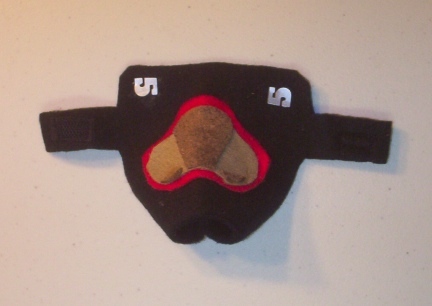 This is a Thoroughbred Racing Saddle Pad, with and English Saddle....but come on, it's fun! Little Mac is learning the barrels, but still not too fast on them yet. Soon we shall get a video. I made this outfit for Little Mac and made it just a bit big. I a thinking it might fit him for Thanksgiving...but here is a photo. I guess I just now caught on to what he has been doing. Little Mac has taught me that when he is running around on my desk and comes over to me and stops and stays next to my hand.....he wants a "rub down". So our training is mutual. 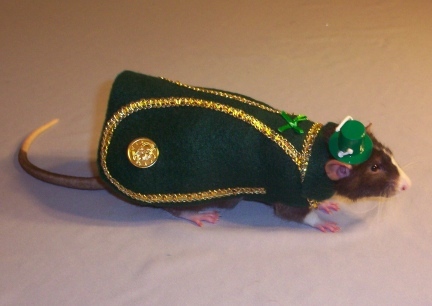 This is one smart rattie! 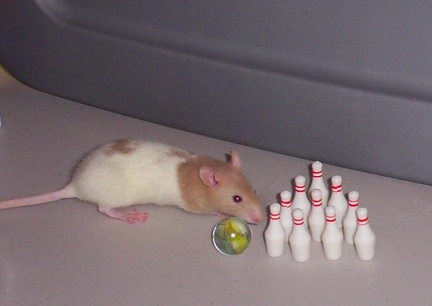 Today while in town I bought Little Mac a little set of Bowling Pins. 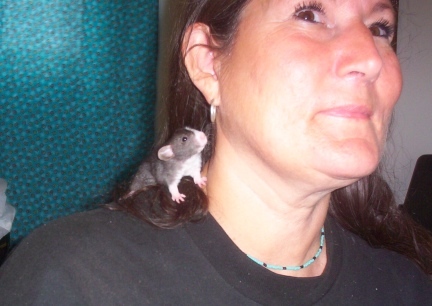 Not as small as the ones I normally use for ratties, but small. 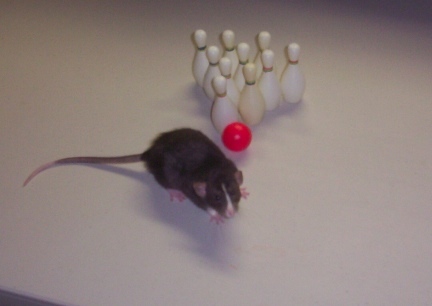 I set them up then set the little light weight bowling ball in front of the pins. 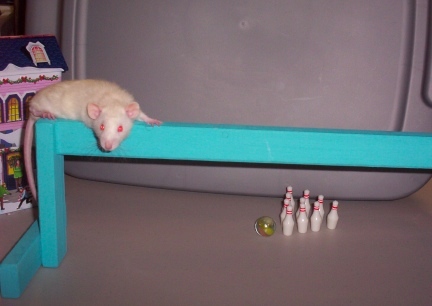 I put Little Mac in front of the pins and told him "Bowl", he went for the ball. Backing up. I have been setting a Ping Pong ball on top of this cute little bitty wooden wine like cup that I place a yogurt treat in. I have this set up in his cage. So he knocks the Ping Pong ball off the wooden cup to get his yogurt treat. MOST of the time the cup is left upright. So, to continue, Little Mac went right for the ball and moved it. A few pins fell. I reset the pins and again, he did well. 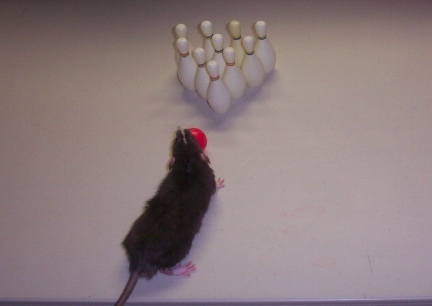 I think a heavier ball, thus they use the marbles with the tiny sets, will knock the pins over. So later, I set Little Mac on the table and told him "go round" as I moved my finger in a circle around him.....he spun. Then I asked him to "sit up" and left my hand just above him....and yes, he did that too. To make sure he was actually doing this, not just a one time thing, I repeated three times each...what a rat. He repeated the behaviors too. NOW! To put those to the command so that he recognizes the word and puts the command to action....and get a video of it all! about COMING THROUGH the Open Tunnel. Little Mac is working on a new Thanksgiving course and is now working on Tunnels.....He was doing really well. Now? He has decided that staying in the Open Tunnel, returning to the Open Tunnel (as in goes through, does the next jump then wants to go back in the Tunnel) and staying in the Open Tunnel is far more fun then finishing the course. BUT! We are working on that , if I collapses the back or what would really be the front end after his head is coming out the other end.....then he sees it is closed and moves on. Then the next time through he will move right out. Then pretty soon, on another run, or another day.....here we go again. You just have to laugh at him. We are hoping to have a video of him soooooooon. DANG IT! He is a riot. The other day I sat him on the table and BAM, he ran the barrels (cans) in the correct pattern, lickity split! Since then. Not really. I made the mistake, I know I know, chew me out.....I knew better. I was teaching him to "Spin" and to "Stand" and he did them well, is doing them well, and doing them on command.....but then.....I thought, I know, I was wrong, I knew the better, but, I thought "pedestal" Yes, I did. 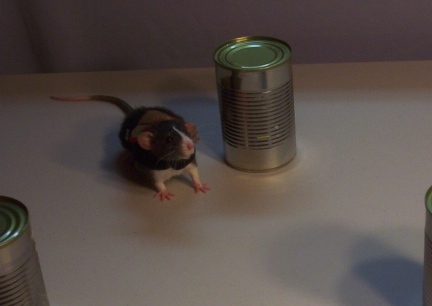 I invited him up unto one of the cans, He stood right up on it, I made a big fuss. Correcting problems is harder then not being so stupid as to teach something like that, ey? So, now you know the problem I am correcting. I have also added a few props to the "scene". He is a curious one for sure. 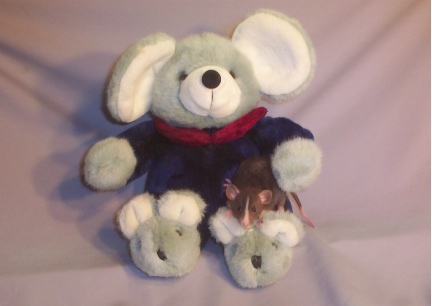 I have never had a rattie that now only smells things but has to lick them too. So go the barrels, but, I am hopeful to have a video soon. Little Mac has been working on a Thanksgiving Video. These are from his rehearsals. Hopefully it will all come together very soon. This is a note that I sent to a Rat List I host on line. I LOVE MY LITTLE SMART BUCK.....but, as a trainer, and one that enjoys the hyper does, here is a little ditty I wrote to ask Deron for another rattie! <grin> One who would never take the place of Little Mac, but would be less frustrating to train. I know, I know, I am growing as a trainer learning to work with a young buck that would rather just sit by me or be on my shoulder or lap while I work at the computer or pee on everything......anyway, just for fun....sung to the old and tried and true.....Doe A Deer! 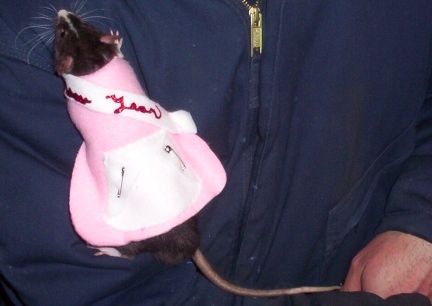 Doe - A Rat, a Female Rat. 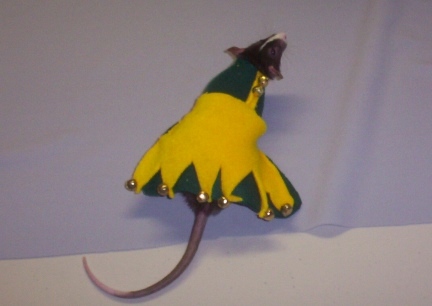 A doe rat that likes to RUN! Me - A name I call Myself. Far - the length bucks see the course. That brings me back to I need a Doe! I have to say training a buck is much different then training a doe <I know, duh!> But until Little Mac, I did not realize how different. LaRue, a buck we had trained a while back, as well as Max, were not this hard to train. Now? They had straight ears, Little Mac is a Dumbo. I have heard others say this too, Dumbos are more laid back then straight ears. I know, when thinking about it, straight earred does seem to run the course or train to the course more easily then the two (yes, I only have two dumbo does I have reallllly worked with, had other Dumbo Earred trained but not for the agility course) dumbo does I have worked with. Little Mac is doing very well at "Stand" on command. He will wear clothes for as long as I like for him to. He will as do the "Turn in a Circle" very well too. 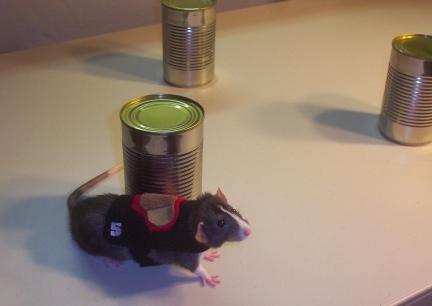 These photos shows him wearing a little hat as he does his tricks....go Little Mac! 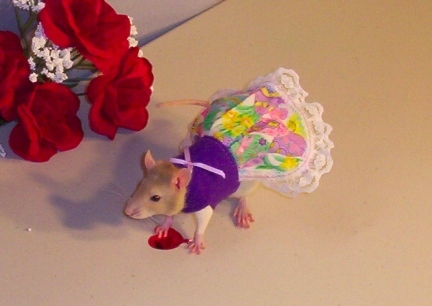 Little Mac the Model Rattie! 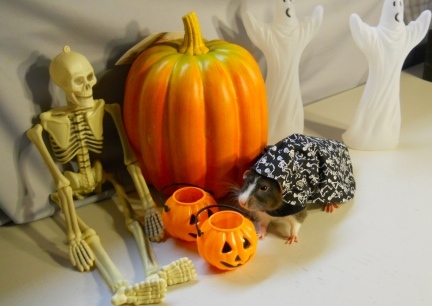 I love these photos, ok, I love this little rattie. 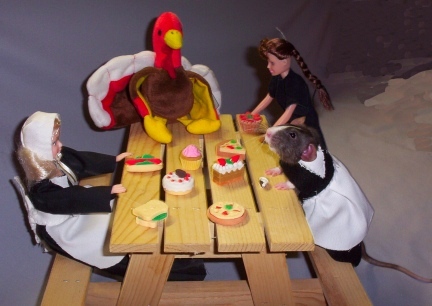 Today we started filming the Thanksgiving Video. I wish I could say it was all good. But, it was pretty good. I am pleased with the way it is going. We have some shots to look at...I kept walking in front of the camera, it was not always Little Mac. <grin> So soon, very soon, we hope to be showing it off. It took a lot to get this up and going. Little Mac wanted to eat sideways on the picnic table bench, or under the table. He wanted to smell, and lick all the Agility Equipment Pieces....then there were editing hiccups....but here it is and it makes me laugh every time I see it. I hope you get the Alice's Restuarant tie in.....we sure had fun....now on to the Christmas Video! We are working on the next Video....well, let's say working towards it. Little Mac is working on the Agility Pieces chosen, and getting used to the props that will be in the scene. That takes a bit of time. He needs to be comfortable with and learn to ignore all that is set around him and just do what he is trained to do within the area set for him...well? That is the plan. <grin> Yesterday I finally found a couple of older Ken dolls along with a few older Barbie dolls. I will be working on costumes for them and for Little Mac and a few boxes that will become "buildings". We, Little Mac and I that is, Deron just sighs....are actually working towards three new videos. It takes a lot. 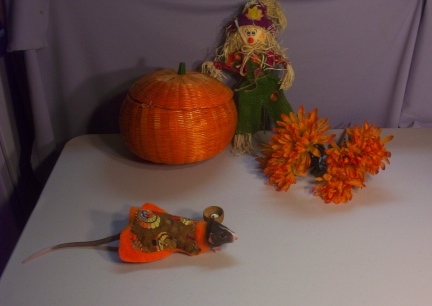 It looks like I just put it all on the table, set the rattie down and away he goes....how I wish. Then Deron, bless his heart, films, edits, works with music, and puts it all together...I call him the Master Film Maker. I leave the lid open on Lille Mac's cage when we are at our desks. The cage sits between our desks. A couple of days ago he decided to come out on his own. Prior to that he would stand and look at me for me to get him out. Until today, he just would sit on the top of the cage and wait for us to get him. Today, he climbed up my leg. The second time he did this he climbed on up on the desk, helped himself to a cracker, and sat on the desk and ate it as if "I am a people, I help myself to breakfast." 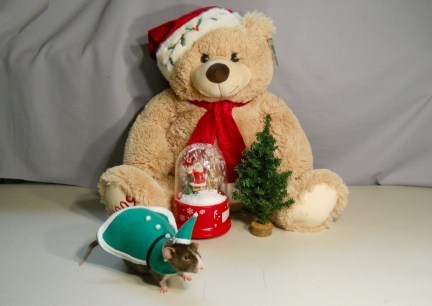 Doesn't everyone decorate, <cough> I mean dress up their ratties for Christmas time? 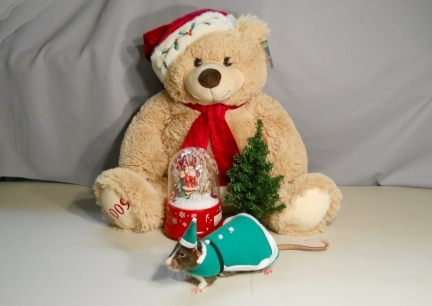 Little Mac received his very own Christmas Card! More to come...just a quick update! Today I finished a gift for Little Mac's brother Asherat. Asherat belongs to a friend of mine and while he and Little Mac will not be at the party. 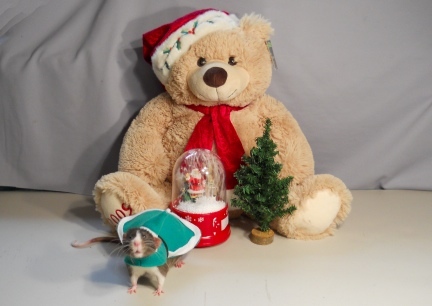 I am pretty sure that he and Wendy will appreciate the Rattie Santa Hat that they will receive at the party. 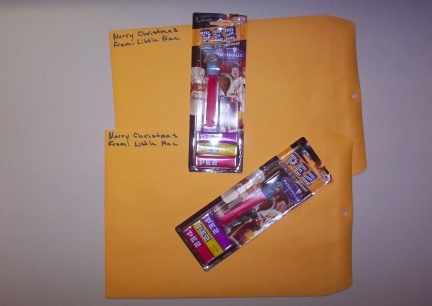 These are the Christmas Gifts that Little Mac sent out to the two people that sent him cards. Who knows if or what Little Mac will mail out next year to the people that send him Christmas Cards. 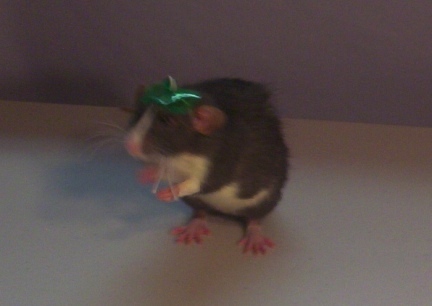 MERRY CHRISTMAS FROM LITTLE MAC! HAVE A SAFE AND HAPPY NEW YEAR 2011! Well we had this idea for a Video.....Little Mac did not want to "act", but here are a couple of photos from the scenes. ST. PAT'S WILL BE HERE BEFORE YOU KNOW IT! And one thinking ahead. I am please with how this outfit came out! I have several tricks I am hoping to teach Little Mac. One is to walk on his back legs. The other is that little basket trick. Right now I need to catch up from the holidays. But later next week I am going to find that itty bitty basket I bought. 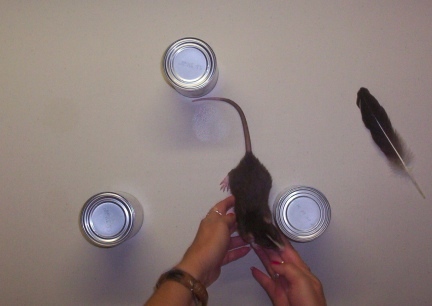 I have seen a goat, monkey, and a rattie do this trick. They pull on the string that dangles over a table or something to bring the basket up to them so they can reach in and get the treat. You tie a string to the end of a tiny basket. You can make one out of cardboard too. 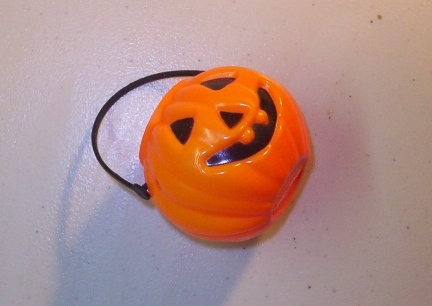 I might start with a little bitty jack-o-lantern that I bought and taught Little Mac to find a treat in. 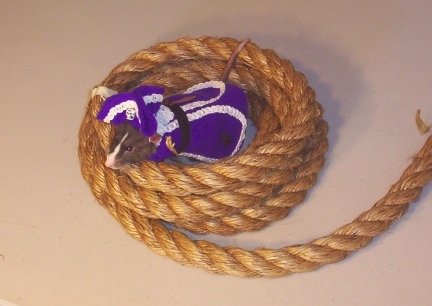 Whatever you use, it needs a handle to tie the string to and needs to be deep enough that the treat does not fall out when the rattie is pulling the string up to it to get to the basket. 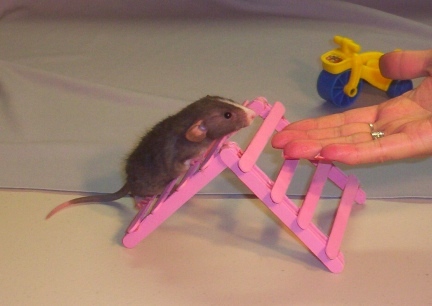 You teach the rattie to find a treat in the basket.Set the rattie on a table or such. And tape the string (about 8 - 12") to the side of the table and let the basket hang. 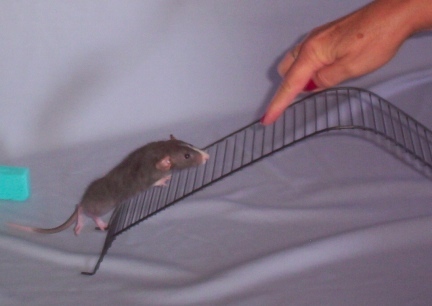 As you are teaching the rattie, at first hold the string so that the basket is just out of reach for the rattie. 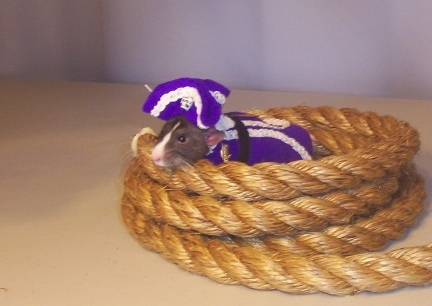 It might take the rattie a minute to figure it out. 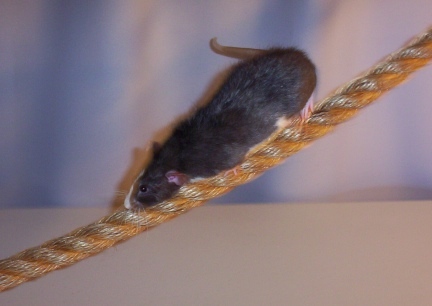 As the rattie catches on, lower the string just a little bit at a time. In about a week of daily training (twice or three times daily) your rattie will retrieve the basket all the way by the string alone. If Little Mac does well with these two tricks, I have more ideas. I am very behind in posting on this page. Shame on me. I hope to get back to it next week. 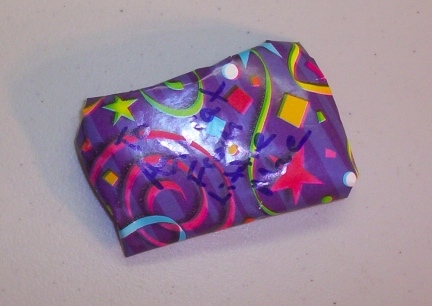 I am also planning on starting Little Mac on some new tricks. 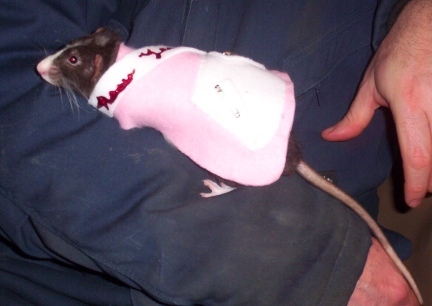 Remember when I said I wanted "Doe a Rat, a female rat"? Well here are our new baby girls. The dumbo eared is Pinky Sue and the straight eared is Katy. I hope to have videos of these girls before too long. I have been training Little Mac to "Play Piano". That is to stand behind the little Grand Piano and hit a few keys. 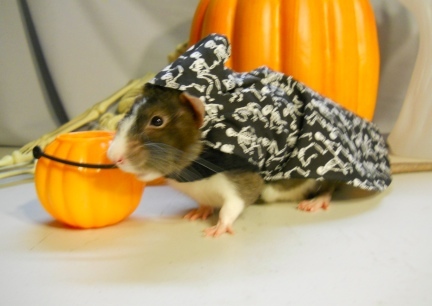 You can see how to train your rattie to do this if you visit our Rats Learning Tricks page here at this site. Little Mac does really well, but the keys are harder for him to hit hard enough to make sound. No. I do not want to add leverage boards to this piano's keys. 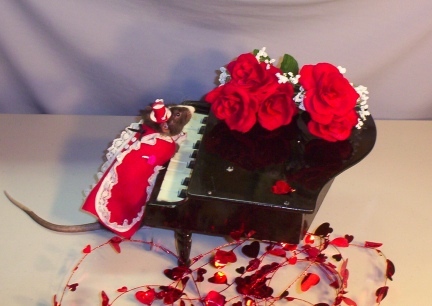 But it is an idea for a different little piano. All and all, training is going very well. Little Mac is an angel when it comes to wearing and even preforming in outfits, clothes or costumes. Today we did a bit of filming for the upcoming Valentine's Day Video. 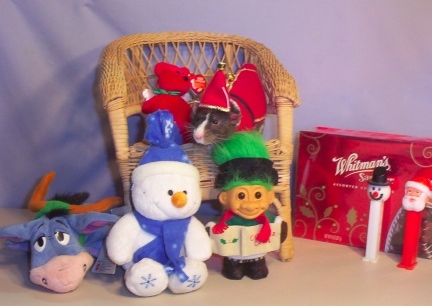 Here are some photos shots we took of Little Mac, Pinky Sue and Katy. Ever had one of those mornings when it went realllllly well? I worked with four baby hamsters, and that went very well. I got out the baby girl ratties, that too, really went well. 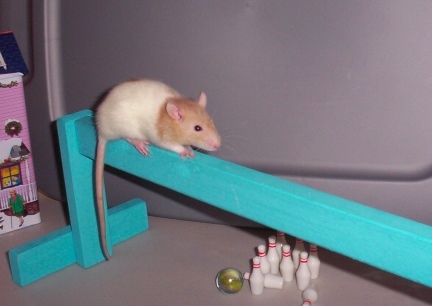 Then I got Little Mac out to work on Tricks. At first all he wanted to do was sniff where the others had been (of course!). So I cleaned the area, got out a different towel, so he would not slip, and man! You can just see the light bulbs go off with this little guy. Now? We are talking about Little Mac here......will he indeed "perform" when I want him to in front of the camera?????? I am going to remain positive and say.....YES! HE SURE WILL! 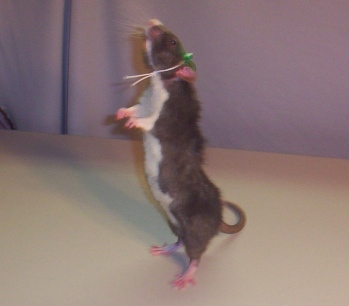 Little Mac is relearning or taking a refresher course on, "Stand" and will be. later, working on "Walk Like Remmy" (walking on his back legs). He is also working on "Circle", turning in a circle, right now on all fours, maybe later on "like Remmy". 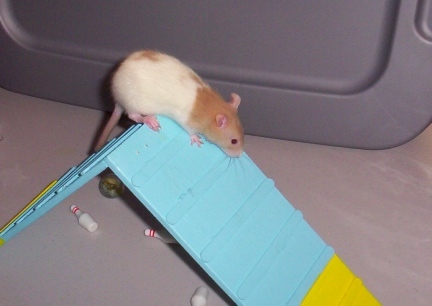 With the hamsters and baby girl ratties, little bitty baby training steps. The hamsters are backchaining. They are so cute, and greedy, when they get to the "Pause House" they fill their little pouches. LOL That is ok. They are starting to learn to not only take treats from my hand, but that treats are waiting at the end of the agility course. This afternoon I did it all again. Little Mac again did very well. He even, without me asking, walked on his back legs to me, more then once. ANOTHER VIDEO WHERE LITTLE MAC IF THE STAR. HE SHOWS OFF IN THIS ONE WITH HIS NEWLY LEARNED TRICK "PLAYING PIANO" AND HE EVEN TAKES A LITTLE BOW. 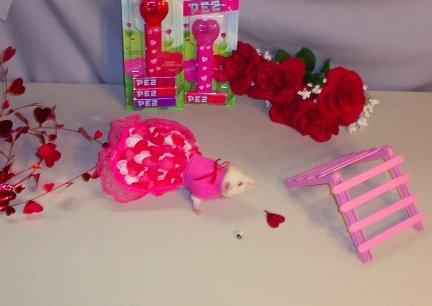 ALSO IN THIS VALENTINE'S VIDEO YOU WILL SEE PINKY SURE AND KATY AS WELL AS OUR LITTLE BABY HAMSTER, COAL, DOING A BIT OF AGILITY. HAPPY VALENTINE'S DAY AND THANKS FOR WATCHING! I can not believe the day has come when Little Mac is full grown and a year old. I will always see him as a baby. 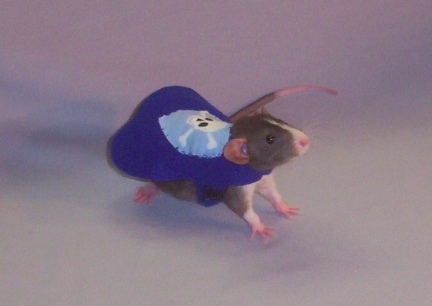 I needed Little Mac to model some Cloaks for us to show how cute a rattie can look in them for our sales pages. He loves the "modeling" he is so good about getting dressed up and standing for photos. He gets all the extra attention. And treats. And loving. As if he never gets those. <wink> He would however like to pose himself.....and I would let him <grin> if he just chose better stances. 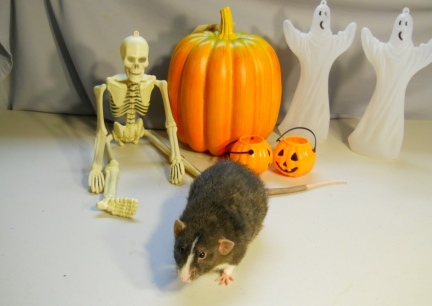 Seriously, he really is perhaps the best rattie model we have ever had. We can change his clothes five times, put on hats, take them off, change them. He does not care. Never "fights" it at all. He will also leave them on for how ever long I like. He walks around in them just like a dog walks around in a coat. Little Mac is such a gooooood boy. But then, he has been wearing clothing since he was, well, weaned. I can not believe he is a year old now! Gosh. It has gone toooooo fast. 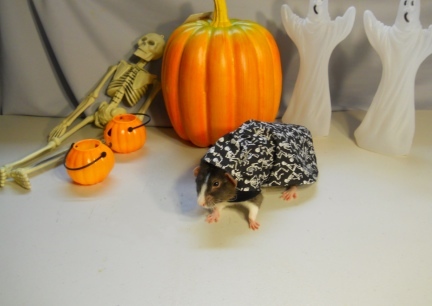 He just better be one of these ratties that lives to like five years old. I hate to even think of the day. Little Mac has many Internet Friends. 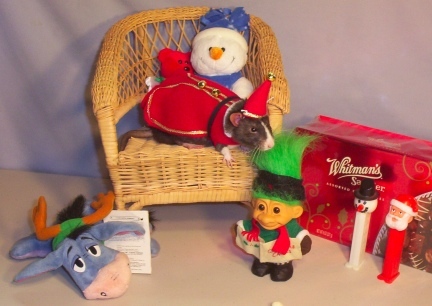 A few sent him gifts for Christmas. Mary in TX sent him a treat mix and acorns (Deron has the acorns to plant so that our animals will always have acorns <wink>) Alica in NC sent Little Mac treats and much more. 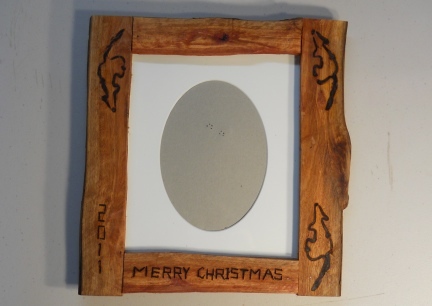 Josephine in CA sent a handcrafted, by her son Joseph, Picture Frame and card made just for Little Mac. Little Mac is now over two years old and in very good health. But, as we all do as we age, he too is slowing down and is now uninterested in doing things he enjoyed in his youth. He no longer eats a whole cracker in the mornings or scurries back and forth between Deron and I as we work at our desks. He is a buck, and bucks, when they age, seem to like the world to come to them, rather than going out and about to enjoy the world.